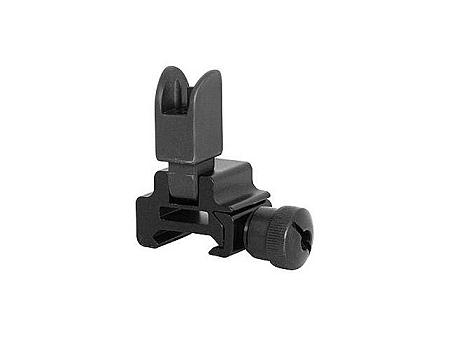 NcStar AR-15 Flip Up Front Sight is a durable and compact flip-up front A2 style iron sight. • Precision made flip-up A2 front sight. • Will fit virtually all AR-15 Picatinny rail gas blocks as well as standard Weaver/Picatinny style rails. • Manufactured from steel and aluminum, the MARFLF will not melt on your gas block under sustained shooting. • A2 front sight is fully adjustable for elevation. • Front sight post fold down out of view of your optics when not in use. • Large steel thumb nut and precise rail clamp for positive and secure attachment to your upper receiver. • The mount and front sight post is made from high quality aluminum and steel.